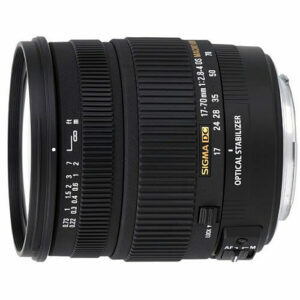 Lens Description: Sigma’s 17-70mm f/2.8-4 DC Macro OS HSM is the practical zoom! A large-aperture, standard zoom lens for digital cameras with an open-aperture value of f/2.8 (at 17mm) and covers the most frequently used focal lengths. With an aperture fast enough to be used in many light situations, its close focusing for use with very small object and its outstanding optical performance make this an ideal all-around lens for landscapes, portraits, still life studies, group shots and just about any everyday photo situation. The OS, Sigma’s anti shake feature, offers the use of shutter speeds approximately 4 stops slower than would otherwise be possible. The OS feature allows Sony and Pentax users the option of viewing a stabilized image in the viewfinder, a feature offered only by Sigma. HSM ensures quiet and high speed AF capability. With a faster aperture than the typical camera “kit lens” it is an excellent choice for the photographer who has higher expectations for their photo equipment.